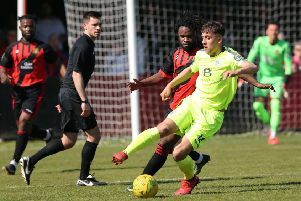 There was disappointment for the East Sussex Football League’s last survivors in the Sussex Intermediate Challenge Cup on Saturday. Premier Division pair Battle Baptists and Sedlescombe Rangers suffered quarter-final defeats away to Mid Sussex League Premier Division opposition. Battle lost 2-0 to Sporting Lindfield, while Sedlescombe were beaten 2-1 by last season’s East Sussex League champions Hollington United. Sedlescombe were two-down at half time before pulling one back from through a Ryan Edwards penalty during the second period. Lindfield and Hollington will face each other in the semi-finals. There was action in four other cup competitions for East Sussex League clubs as another full programme was completed last weekend. Icklesham Casuals surged through to the Hastings & District FA Junior Cup quarter-finals with a 10-2 victory at home to Bexhill Broncos. Sam Norman scored a hat-trick, Joe Fraser and Phil Badrock netted twice each, and Liam Sayer, Edward White and Adam Sully also got on the scoresheet for an Icklesham side lying third in Division One. Jack Harris and George Smith replied for their Division Three opponents. Wadhurst United joined Icklesham in the last eight after triumphing 6-3 at home to Crowhurst in an all-Division One affair. Jack Austen, Frazer Discala and Gary Croft netted for the Crows. There were three second round ties in the Robertsbridge Charity Junior Cup. The JC Tackleway II, from Division Two, were made to work for their 4-2 win at home to Division Four’s bottom side, Ticehurst. A Danyal Aldous double, and one apiece from Chris Taylor and Tom Bexhell took Tackleway through. Rock-a-Nore ran out 5-1 winners at home to fellow Division Two team Catsfield. Reece Johnson added four more goals to his prolific tally and Liam Miles got the other for the Rocks. Northiam 75 II won 2-1 at home to West Hill United in an all-Division Four affair via the finishing of Paul Rockett and Adam Page. Conor Loake scored for West Hill. South Coast Athletico are through to the ESFL Wisdens Sports Challenge Cup quarter-finals after winning 5-0 away to Division Three rivals Hawkhurst United II. Connor Easton scored a hat-trick, and Mike Hawley and Bradley Owens also netted for an Athletico team which will visit Tackleway II in the last eight this coming Saturday. Robertsbridge United II received a walkover at home to Bexhill AAC II, who were unable to field a team. There were also league matches in all six divisions on Saturday. Sidley United strengthened their hold on third place in the Premier Division without kicking a ball as scheduled visitors St Leonards Social couldn’t raise a side. Sidley are now level on points with second-placed Battle Baptists, having played an extra game, and only three behind leaders Bexhill Town. Social are now bottom of the table because Bexhill AAC moved above them on goal difference, albeit having played two more matches, with a 1-1 draw at home to sixth-placed Hawkhurst United. Luke Dangerfield’s goal for AAC was matched by Casey Ham for the Hawks. Punnetts Town went top of Division One courtesy of a narrow 4-3 victory at home to The JC Tackleway. Charlie Cornford scored a hat-trick for fourth-placed Tackleway, but it wasn’t enough to stop Punnetts claiming a win which put them two points above Wadhurst having played two more games. It was honours even in the battle of the bottom two as Herstmonceux and Mountfield United contested a 1-1 draw. Mark Stillwell found the net for Herstmonceux, who remain two points adrift of Mountfield with a game in hand. Steven Fortsch was Mountfield’s marksman. Their front side might not have been able to fulfil its fixture, but St Leonards Social II powered on at the top of Division Two with an 8-2 success at home to fifth-placed Wittersham. Social are now five points clear of second-placed Battle Baptists II, albeit having played four more matches. Sedlescombe Rangers II moved into the top three - above Rock-a-Nore on goal difference - by dint of a 1-0 triumph at home to seventh-placed Peche Hill Select. Liam Cobley scored the only goal. Third beat second in Division Three as Bexhill Rovers prevailed 5-1 at home to Victoria Baptists through the finishing of Iain Stuart Powell, Aaron Green, Luke Alais, Mark Phillips and Aaron Cochrane. Jake Adams netted Victoria’s consolation. Rovers are now a point behind Victoria with four games in hand and leaders South Coast Athletico having played two fewer matches. Bottom-of-the-table Magham Down earned a 2-2 draw at home to fifth-placed Sandhurst to leave the bottom five teams covered by just two points. The goals of Tyler Capon and Harry Wood for Magham were matched by Robert Pollard and Craig Walsh for Sandhurst. Division Four leaders Hampden Park suffered a 4-2 defeat away to a Cranbrook Town side which is up to third. The goals of Jon Bilsby (2), Wayne Beaney and Callum Hatcher for Cranbrook inflicted only a second league loss of the season on Park, whose scorers were Jake Barker and Joe Sommers. Sovereign Saints II moved up to second, albeit seven points behind Hampden Park with only three matches left, following a 4-0 win away to Parkfield. Strikes by Chris Williams (2), Jamie Fraser and Jordon Funnell did the damage. Third-placed Cranbrook are eight points behind Hampden Park with two games in hand, but the team with the best chance of catching the leaders appears to be fourth-placed Northiam 75 II, who are nine points off the pace having played four less matches. Battle Baptists III, who only have two league fixtures remaining, climbed into the top half on the back of a 9-0 victory at home to Sedlescombe Rangers III. Ryan Jinks netted a hat-trick, Dale Matthews bagged a brace, and there was one apiece for Ryan Souter, Matthew Ward, Liam Chantler and Joe Wallace. It was a good day for Division Five leaders Little Common III. The Commoners marched on at the top without even kicking a ball as scheduled visitors Hampden Park II were unable to field a team. And to make things even better for Common, the clash between their title rivals, AFC Hollington and Welcroft Park Rangers, ended in a 1-1 draw. Emile Tambeh scored for Hollington and Jordon Cull for Rangers. It all means that second-placed Rangers trail Common by eight points with two games in hand and third-placed Hollington are 11 points off the pace having played three less matches. Burwash rose above Hooe into fourth place after beating them 5-1 at Swan Meadow. Liam Baker plundered a hat-trick for Burwash, whose other scorers were James Rose and Blake Marchant. Liam Elphick claimed Hooe’s consolation. Games are scheduled for all six divisions this coming Saturday, along with quarter-final ties in each of the league’s three knockout competitions.